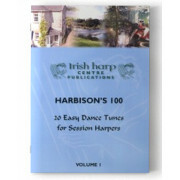 Volume 1 in the Harbison 100 series. Easy arrangements of the 100 best known Irish dance tunes for social playing in a ‘session’ for harpers at Level 2 (with about 2 years + playing experience). Set Dance : St.Patrick’s Day.